What if we can design transit to improve our health? Transit is linked to both mental and physical health in numerous ways and can be leveraged to improve the overall health of Canadians. The planning and design of transit systems, infrastructure and vehicles can transform daily commutes in a manner that no other mode of transportation can. 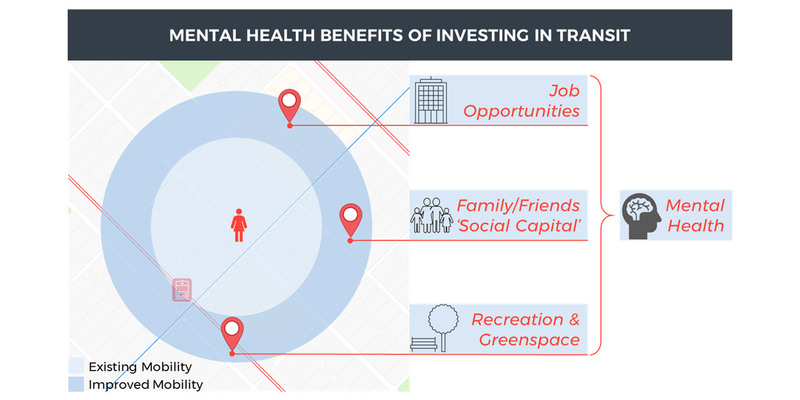 A well-designed transit system moves people efficiently and affordably, connecting communities and increasing opportunities for physical activity, education, employment, social interaction and access to nature, all of which are crucial for mental and physical health. There is also an obesity crisis in Canada, with over 1 in 4 Canadian adults classified as obese, a figure that is projected climb due to unhealthy eating and physical inactivity4. Diabetes is also on the rise and is projected to reach 16.4 per cent of the population by 2027, compared to 7.1 per cent in 20025. The factors contributing to these alarming trends are numerous and complex, but intuitively, the systems used to move around cities and towns, to access jobs, schools, recreational activities, and social networks, play an essential role. In 2014, The Medical Officer of Health for Peel Region Public Health stated that, “How we move around and the impact it has on the leading causes of death and illness in our society is something all health organizations [are] coming to grips with”6. 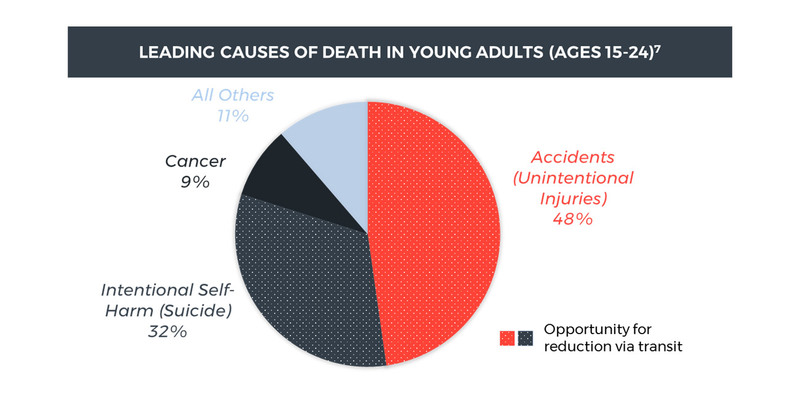 Transit can play a critical role in reducing the staggering number of deaths from accidents and suicides—the top two causes of deaths in young adults—by reducing the number of vehicles on the road and providing mental health benefits. Transit is linked to both mental and physical health in numerous ways and can be leveraged to improve the overall health of Canadians. Gaps in existing transit systems can be improved to encourage transit usage and provide more pleasant journeys to enhance the wellness of transit users8. Canadian cities have been designed in a manner that is highly dependent on cars, and many Canadians perceive transit as a less desirable mode choice than a personal vehicle due to the greater flexibility and comfort that it tends to provide in a Canadian context. However, there are other benefits to using transit that make it a more desirable transportation option in many cases—including its positive impacts on health. The Societe de transport de Montreal found that the typical transit user achieves one-third of their recommended daily step count through active transportation at one or both ends of a transit journey13. There is evidence-based research that shows that there is an indirect relationship between physical activity and obesity rates—as one increases, the other decreases. It is evident that the United States and Canada have higher obesity rates compared to Europe, which can in part be attributed to higher dependency on car usage14. Increased obesity rates lead to high public health spending, and with increased public transit use, there is an estimated economic benefit of $2.2 billion from prevented deaths due to increased physical activity and reduced air pollution in the Greater Toronto and Hamilton Area alone5. Considering this, the potential economic benefit on a country-wide scale is enormous. Transit can also contribute to decreasing road traffic injuries and deaths, which have been described as a global public health problem by The World Health Organization, as there are nearly 1.3 million road traffic deaths worldwide each year15. Looking to the future, there is an opportunity to implement transit solutions which mitigate public health issues due to air quality. Urban smog is a major public health issue and is increasingly the focus of public alarm. The Transportation Association of Canada has stated, “The impacts of air pollution on human health include eye, nose, and throat irritation, reduced lung capacity, aggravation of respiratory diseases, cancer, and premature death”16. Transportation is a significant contributor to the generation of harmful air pollutants within city centers. Primary causes are emissions from combustion engines, and the accretion of Prime Particulate Matter (PM). Notably, road dust caused by automobiles accounts for 48 per cent of PM in Canadian cities17. Railway travel generally is the most energy efficient way to move goods and persons over land, and can significantly reduce PM and emissions of other harmful compounds. Shifting to rail-transit saves energy, reduces fossil fuel consumption, and eliminates the associated emissions, while also reducing the quantity of PM due to road dust and traffic congestion. Further reduction in emissions can be realized via projects such as electrification18, which provide more energy efficient solutions, and depending on the source of electricity, can eliminate emissions altogether. A study based in Turin, Italy establishes a direct link between transit and mental health, finding that people living in ‘deprived’ neighbourhoods (defined in terms of quality of transportation, among other features) were slightly more likely to suffer from depression20. The authors posit insufficient mobility to easily travel outside of one's neighbourhood as a potential explanation, but this does not come close to capturing nearly all the ways in which transit and mental health are connected. 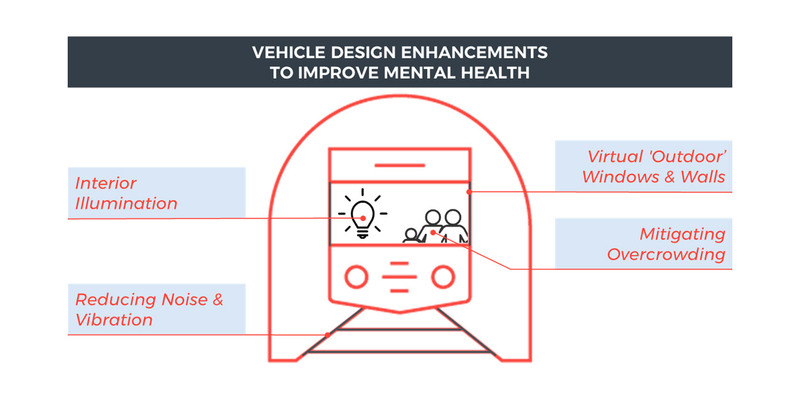 On the other hand, many indirect mental health benefits of transit exist, which can be broadly categorized as those associated with using transit, and those associated with the mobility that a quality transit system provides. What are the mental health benefits of being a transit user? 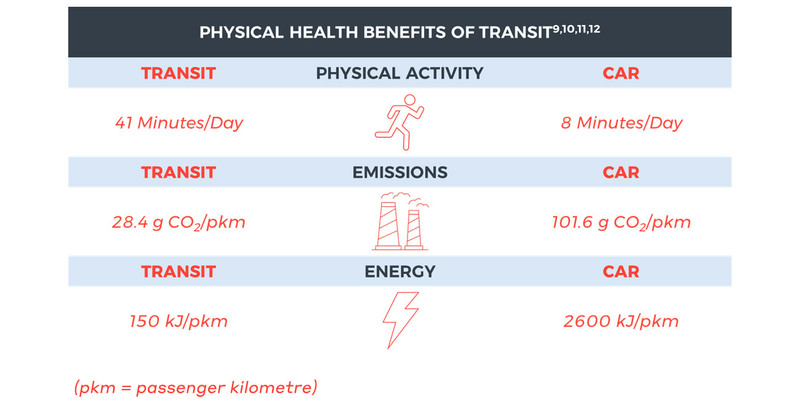 The most significant mental health benefit of using transit is one associated with the substantial physical health benefits previously discussed. The tendency for transit users to engage in physical activity on their commutes has a positive impact on mental well-being due to the extra endorphins produced as a result of exercise21. Transit also creates an environment where face-to-face social interactions are more likely, which research has shown to be beneficial for mental health. A 2015 study found that “limited face-to-face social contact nearly doubles someone's risk of having depression”22, 23. Transit provides a setting in which such contact can occur. A study of over 1500 bus and train passengers in Wellington, New Zealand found that, while some passengers engaged in behaviour to intentionally avoid contact, almost 25 per cent of passengers participated in conversations during their trips24. A final benefit is that time spent on transit can be utilized for a variety of discretionary purposes compared to other modes. Passengers “can choose high quality public transit when traveling on major urban corridors, and be able to work or relax instead of bearing the stress of driving in congestion” 25. What are the mental benefits of investing in public transit, to society overall? Consider a city that has decided to invest in their transit system; perhaps adding a new high frequency rail service, creating a bike share network, or improving the reliability of the bus network. Such investments are about improving mobility, and there are many well-established benefits to this, some of which directly correlate to mental well-being. One obvious benefit is economic; the benefit of improving and expanding access to jobs and educational opportunities. This may indirectly result in an incremental improvement to general mental health. Studies have shown that “poverty—and the material and social deprivation associated with it—is a primary cause of poor health among Canadians” 26, 27. Improved access to employment opportunities can help to alleviate poverty and thus improve mental health outcomes for society overall. According to a survey conducted by the American Public Transportation Agency (APTA), “82.8 per cent of all transit trips [are] taken for either employment or educational purposes”28, so it stands to reason that transit improvements have the potential to directly and significantly affect access to job opportunities for people that need it most. Improved access to recreational activities, green spaces and the natural environment in general is another benefit with positive mental health outcomes. Studies have shown a correlation between restricted access and exposure to green spaces and higher rates of mood and stress disorders, such as depression and anxiety31, 32, 33. A good transit system can mitigate against these disorders by providing convenient access to such spaces. Having considered the general mental and physical health benefits transit can provide, it is important to note that this can only be achieved with well-designed systems. But what does it mean for a transit system to be ‘well-designed’ in the context of promoting good health? What improvements can be made to existing systems to optimize for this? 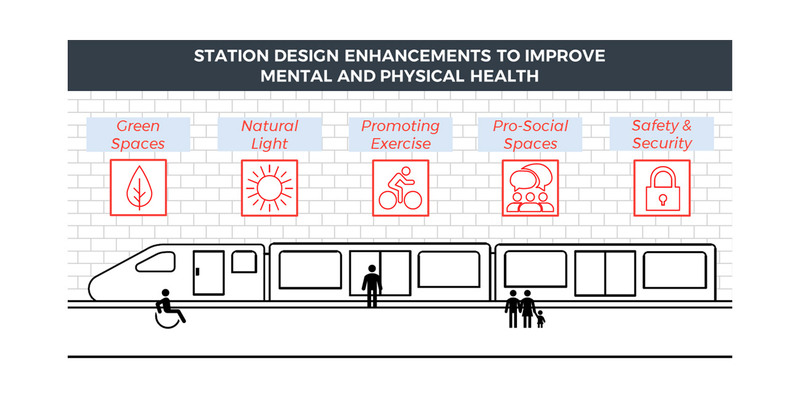 Integrate nature and green spaces: Station design should integrate with green spaces to provide commuters with greater access to nature as an effective method of reducing stress and depression. Doing so promotes exercise, social interaction and allows greater access to sunlight and fresh air. Exposure to sunlight triggers the release of serotonin and allows absorption of vitamin D, reduces the risk of cancer, and treats skin conditions34. Fresh air boosts the immune system, provides energy, and improves heart and brain health, all while having a calming effect35. It is critical to consider that the integration of green spaces in transit design is only effective if the spaces are convenient, accessible, and well-managed36. It is imperative to integrate nature into stations/stops by bringing the outdoors inside, e.g. “living walls” of plants and utilizing natural light. Bring natural light into underground spaces: Lighting is one of the biggest design elements that building users complain about37. Raad Studio partnered with the Korea-based technology company Sunportal to design and test optical devices that track the sun every minute on a daily basis38. These devices intend to optimize the amount of natural sunlight that can be captured. This technology allows the captured sunlight to be distributed through protective tubes to a central distribution point. A solar canopy can then be used to spread the sunlight across underground spaces—spaces like subway stations. Transit commuters can now experience the direct benefits of sunlight in underground areas as well as indirect benefits that stem from plant landscapes which can now be grown underground. Promote exercise and activity: Active spaces for exercise should be integrated into transit design since physical activity can treat mild to moderate depression without the use of anti-depressants36. Humans have a biochemical need for exercise, and fulfilling this need results in a multitude of benefits including improved sleep, higher self-esteem, and stress-resilience. Designing for active transportation is the biggest opportunity for transit to implement active spaces. It is important to integrate and enhance infrastructure that supports cycling and walking; transit design must provide safe and convenient pedestrian and bike paths, and seamless connections between alternative transportation modes. Encourage social interaction through pro-social spaces: Humans have a biological need for interpersonal interaction. In general, the quantity and quality of social interactions impact mental well-being. Transit-friendly neighbourhoods provide an environment for natural, daily social interaction, while mixed-use design can actively promote social interaction through pro-social spaces. Pro-social spaces can be extremely effective; they can foster feelings of belongingness to a community, provide opportunities to improve trust levels and increase empathy and self-confidence39. Volkswagen’s ‘The Fun Theory’ demonstrates that fun can change people’s behaviour for the better40. It is useful to look at how behaviours can change within pro-social spaces through “fun” designs. Take measures to improve safety and security: Safety and security are of utmost importance in transit design. Feeling unsafe can increase stress and anxiety and therefore, transit spaces must be designed with crime prevention in mind. Public routes must be clear, and natural surveillance should be provided by designing for proper visibility. Research has demonstrated the links between dilapidated, deteriorating built environments and urban drug and alcohol use, and crime, leading to feelings of reduced safety41. Designs must ensure that infrastructure is dignified and well-maintained, and must consider diversity and the inclusion of all demographics to provide an environment where everyone can feel safe. Interior Illumination of Vehicles: Improving lighting design in subway vehicles by installing blue LED light can have a calming effect on riders suffering from mental illness. Providing adequate lighting that resembles natural light can improve people suffering from seasonal depression. Studies have shown that people suffering from Seasonal Affective Disorder (SAD) can benefit from using Blue light therapy, “The intense artificial light causes a chemical change in the brain that improves mood and helps relieve SAD symptoms” according to the Canadian Mental Health Association (CMHA)42, 43. Design Improvements on Windows and Walls: Another improvement is designing the interior of subway vehicles to have a virtual outdoor feel. Namely, vehicle windows equipped with LED screens that project outdoor scenery while vehicles are in subway tunnels. Wallpaper type flexible LED screens on the interior wall of a vehicle that can display nature-like scenery give the illusion of an open, airy space. This design helps people suffering from anxiety and claustrophobia to tolerate the confinement of a subway. A similar concept has achieved positive results on MRI machines providing skylights and painted walls to help patients cope with claustrophobia44. Reduction of Noise and Vibration: The noise on a subway can be overwhelming and trigger anxiety attacks. Exposure to vibration may present a health risk and cause pathological damage, information on which is provided in the ISO 2631-145. Reduction of noise and vibration on subway vehicles and in stations can provide comfort for passengers, i.e. investing in Low-Vibration Track (LVT) using ties encased in concrete covered rubber and neoprene pads; lining subway stations with sound absorbent rigid fibreglass and mineral wool to reduce noise and vibration46. It is important to perform routine maintenance on rail tracks and vehicles as transit systems age, as neglecting to do so can have significant negative impacts on passenger ride comfort. Overcrowding and Congestion Mitigation: Crowdedness in public transit is a challenging aspect in transit design and planning. Riders with mental health problems can experience panic attacks when confronted with overcrowding in public transit47. The collection of ridership data (i.e. through smart card fare payment system—Presto card) can help stakeholders and planners design smarter public transit to handle overcrowding and reduce congestion48. By studying ridership data, transit systems can be optimized and adjusted to handle transit demands in real time. Vehicles themselves can be improved to better handle overcrowding—such as adjustable seats designed by PriestmanGoode that can accommodate 30 per cent more passengers on commuter trains49. Over the last 20 years, there has been steady growth in public transit commuting across Canada’s largest cities50 —a trend that is predicted to persist as transit systems continue to expand. What if we can design transit to improve the health of our societies? Mental Health Commission of Canada, "Fast Facts about Mental Illness", Toronto, 2013. [Online]. Available: cmha.ca/about-cmha/fast-facts-about-mental-illness [Accessed: 18-Aug-2018]. "Making the Case for Investing in Mental Health in Canada", Mental Health Commission of Canada, 2010. [Online] Available: www.mentalhealthcommission.ca/sites/default/files/2016-06/Investing_in_Mental_Health_FINAL_Version_ENG.pdf [Accessed: 18-Aug-2018]. J. Tory, "Mental health in our cities is a crisis", The Star, 2018. [Online]. Available: www.thestar.com/opinion/contributors/2018/04/09/mental-health-in-our-cities-is-a-crisis.html. [Accessed: 19- Aug- 2018]. K. Ogilvie and A. Eggleton, "Obesity in Canada", Journals of the Senate, 2016 [Online]. Available: sencanada.ca/content/sen/committee/421/SOCI/Reports/2016-02-25_Revised_report_Obesity_in_Canada_e.pdf. [Accessed: 19- Aug- 2018]. D. Mowat, C. Gardner, D. McKeown, N. Tran, B. Moloughney and G. Bursey, "Improving Health By Design In The Greater Toronto-Hamilton Area", Peel Region Health, 2014. [Online]. Available: www.peelregion.ca/health/resources/ healthbydesign/ pdf/moh-report.pdf. [Accessed: 18- Aug- 2018]. C. Marsden, "Better public transit in the GTHA: Our health depends on it", Global News, 2014. [Online]. Available: globalnews.ca/news/1331457/forget-the-commute-better-public-transit-will-improve-our-health/. [Accessed: 17- Aug- 2018]. “Leading causes of death, total population, by age group,” Statistics Canada, 2016. [Online]. Available: www.150.statcan.gc.ca/t1/tbl1/en/tv.action?pid=1310039401&pi ck Members%5 B0%5D=2.22&pickMembers%5B1%5D=3.1. [Accessed: 10- Aug- 2018]. "Longer life: The public health argument for better transit", CBC News, 2014. [Online]. Available: www.cbc.ca/news/canada/hamilton/headlines/longer-life-the-public-health-argument-for-better-transit-1.2642746. [Accessed: 19- Aug- 2018]. European Environment Agency, “Specific CO2 emissions per passenger-km and per mode of transport in Europe”, European Environment Agency, 2017. “Railway handbook: Energy consumption and CO2 emissions”, Railway Handbook, International Union of Railways, 2017. [Online]. Available: uic.org/IMG/pdf/handbook_iea-uic_2017_web3.pdf. [Accessed: 23- Aug- 2018]. “Civic Sedan - Specifications”, Honda, 2018. [Online]. Available: www.honda.ca/civic_sedan/specs. [Accessed: 23- Aug- 2018]. "100% more active with public transit", Société de transport de Montréal, 2018. [Online]. Available: www.stm.info/en/info/advice/100-more-active-public-transit. [Accessed: 24- Aug- 2018]. Pucher and L. Dijkstra, "Promoting Safe Walking and Cycling to Improve Public Health: Lessons From The Netherlands and Germany", American Journal of Public Health, vol. 93, no. 9, pp. 1509-1516, 2003. "10 facts on global road safety", World Health Organization, 2017. [Online]. Available: www.who.int/features/factfiles/roadsafety/en/. [Accessed: 17- Aug- 2018]. “Urban Transportation and Air Quality Briefing” Transportation Association of Canada, 2004. [Online]. Available: www.tac-atc.ca/sites/tac-atc.ca/files/site/doc/ resources/briefing-ut-and-airquality.pdf. [Accessed: 17- Aug- 2018]. “Canadian Smog Science Assessment Highlights and Key Messages” Environment and Climate Change Canada, 2017. [Online]. Available: www.ec.gc.ca/air/default.asp? lang=En&n=72F82C27-1&offset=7. [Accessed: 17- Aug- 2018]. "WHO | Mental health: a state of well-being", World Health Organization, 2014. [Online]. Available: who.int/features/factfiles/mental_health/en/. [Accessed: 20- Aug- 2018]. G. Melis, E. Gelormino, G. Marra, E. Ferracin and G. Costa, "The Effects of the Urban Built Environment on Mental Health: A Cohort Study in a Large Northern Italian City", International Journal of Environmental Research and Public Health, vol. 12, no. 11, pp. 14898-14915, November 2015. [Online], Available: www.ncbi.nlm.nih.gov/pmc/articles/PMC4661687/. [Accessed: 20-Aug-2018]. "Physical Activity Reduces Stress | Anxiety and Depression Association of America, ADAA", Adaa.org, 2018. [Online]. Available: adaa.org/understanding-anxiety/related-illnesses/other-related-conditions/stress/physical-activity-reduces-st. [Accessed: 20- Aug- 2018]. C. Bergland, “Face-to-Face Social Contact Reduces Risk of Depression,” Psychology Today, 2015. [Online]. Available: psychologytoday.com/us/blog/the-athletes-way/ 201510/face-face-social-contact-reduces-risk-depression. [Accessed: 19-Aug-2018]. J. Vallée, E. Cadot, C. Roustit, I. Parizot and P. Chauvin, "The role of daily mobility in mental health inequalities: The interactive influence of activity space and neighbourhood of residence on depression", Social Science & Medicine, vol. 73, no. 8, pp. 1133-1144, 2011. [Online] Available: www.medsp.umontreal.ca/IRSPUM_DB/pdf/27857.pdf [Accessed: 20-Aug-18]. J. Thomas, ‘The Social Environment of Public Transport’, Ph.D., Victoria University of Wellington, 2009. "Poverty and Mental Illness | CMHA Ontario", Ontario | Canadian Mental Health Association, 2007. [Online]. Available: ontario.cmha.ca/documents/poverty-and-mental-illness/. [Accessed: 20- Aug- 2018]. D. Raphael, Poverty and Policy in Canada: Implications for Health and Quality of Life, 1st ed. Toronto ON: Canadian Scholars Press, 2007. American Public Transportation Association (APTA), "A Profile of Public Transportation Passenger Demographics and Travel Characteristics Reported in On-Board Surveys", APTA, 2007. [Online]. Available: www.apta.com/resources/statistics/Documents/transit_passenger_characteristics_text _5_29_2007.pdf. [Accessed: 20-Aug-18]. E. Sund, S. Jørgensen, A. Jones, S. Krokstad and M. Heggdal, "The influence of social capital on self-rated health and depression – The Nord-Trøndelag health study (HUNT)", Norsk Epidemiologi, vol. 17, no. 1, 2009. [Online]. Available: ntnu.no/ojs/index.php/norepid/article/view/173 [Accessed 20-Aug-2018]. K. Mattisson, C. Håkansson and K. Jakobsson, "Relationships Between Commuting and Social Capital Among Men and Women in Southern Sweden", Environment and Behaviour, vol. 47, no. 7, pp. 734-753, August 2015. [Online], Available: www.ncbi.nlm.nih.gov/pmc/articles/PMC4509867/. [Accessed: 20-Aug-2018]. M. Kondo, J. Fluehr, T. McKeon and C. Branas, "Urban Green Space and Its Impact on Human Health", International Journal of Environmental Research and Public Health, vol. 15, no. 3, p. 445, 2018. [Online]. Available: www.ncbi.nlm.nih.gov/pubmed/29510520 [Accessed: 20-Aug-2018]. C. Ward Thompson, J. Roe, P. Aspinall, R. Mitchell, A. Clow and D. Miller, "More green space is linked to less stress in deprived communities: Evidence from salivary cortisol patterns", Landscape and Urban Planning, vol. 105, no. 3, pp. 221-229, 2012. [Online] Available: www.sciencedirect.com/science/article/pii/ S0169204611003665?via%3Dihub. [Accessed: 20-Aug-2018]. K. Beyer, A. Kaltenbach, A. Szabo, S. Bogar, F. Nieto and K. Malecki, "Exposure to Neighborhood Green Space and Mental Health: Evidence from the Survey of the Health of Wisconsin", International Journal of Environmental Research and Public Health, vol. 11, no. 3, pp. 3453-3472, 2014. [Online]. Available: www.ncbi.nlm.nih.gov/pmc/articles/PMC3987044/. [Accessed: 20-Aug-2018]. T. Legg, “What Are the Benefits of Sunlight?” healthline, 25-May-2018. [Online]. Available: www.healthline.com/health/depression/benefits-sunlight. [Accessed: 19-Aug-2018]. “Getting fresh Part 1: The health benefits of fresh air, “Phantom Screens, 04-Aug-2016. [Online]. Available: www.phantomscreens.com/resource/getting-fresh-part-1-the-health-benefits-of-fresh-air/. [Accessed: 19-Aug-2018]. R. Toms, “Designing good mental health into cities: the next frontier for urban design,” Design Council, 11-Apr-2017. [Online]. Available: www.designcouncil.org.uk/news-opinion/designing-good-mental-health-cities-next-frontier-urban-design. [Accessed: 19-Aug-2017]. B. Howard, “5 Surprising Ways Buildings Can Improve Our Health,” National Geographic, 14-Feb-2017. [Online]. Available: www.nationalgeographic.com/ environment/urban-expeditions/green-buildings/surprising-ways-green-buildings-improve-health-sustainability/ [Accessed: 19-Aug-2018]. “Lowline,” The Lowline. [Online]. Available: thelowline.org/lab/. [Accessed: 19-Aug-2018]. Ride DCTA. (2017, August 17). Five Ways Public Transit Affects your Mental and Physical Health. Retrieved from LinkedIn: www.linkedin.com/pulse/five-ways-public-transit-affects-your-mental-physical-ride-dcta/. [Accessed: 20-Aug-2018]. A. Diaz, "Behind the Work: Volkswagen's 'The Fun Theory'", Adage.com, 2018. [Online]. Available: adage.com/article/behind-the-work/work-volkswagen-s-fun-theory/139512/. [Accessed: 20- Aug- 2018]. “How Urban Design can Impact Mental Health,” The Centre for Urban Design and Mental Health. [Online]. Available: www.urbandesignmentalhealth.com/how-urban-design-can-impact-mental-health.html. [Accessed: 19-Aug-2018]. Canadian Mental Health Association British Columbia Division, "Seasonal Affective Disorder", Canadian Mental Health Association, Vancouver, 2013. [Online]. Available: cmha.bc.ca/documents/seasonal-affective-disorder-2/. [Accessed: 20-Aug-2018]. A. Richarz, “The Amazing Psychology of Japanese Train Stations”, CityLab, 2018. [Online}. Available: www.citylab.com/transportation/2018/05/the-amazing-psychology-of-japanese-train-stations/560822/. [Accessed: 20-Aug-2018]. A. Miller, “How to Cope With Claustrophobia”, U.S. News, 2016 [Online]. Available: health.usnews.com/wellness/articles/2016-05-12/how-to-cope-with-claustrophobia. [Accessed: 20-Aug-2018]. Mechanical vibration and shock -- Evaluation of human exposure to whole-body vibration -- Part 1: General requirements", ISO Standard 2631-1:1997. [Online]. Available: www.iso.org/standard/7612.html. [Accessed: 20- Aug- 2018]. A. Marshall, “Get Ready for Quieter NYC Subway Stations (Yes, It’s Possible)”, WIRED, 2016. [Online]. Available: www.wired.com/2016/06/get-ready-quieter-nyc-subway-stations-yes-possible/. [Accessed: 20-Aug-2018]. M. Tull, “Coping Strategies for Dealing With Large Crowds When You Have PTSD”, verywellmind, 2018. [Online]. Available: www.verywellmind.com/coping-with-large-crowds-2797224. [Accessed: 20-Aug-2018]. K. Philmus, “5 ways technology will improve your commute” Quartz, 2013. [Online]. Available: qz.com/147021/5-ways-technology-will-improve-your-commute/. [Accessed: 20-Aug-2018]. A. Hawkins, “These transformable train seats could make your commute 30 percent less awful”, The Verge, 2016. [Online]. Available: www.theverge.com/2016/9/23/13034330/train-seat-adjustable-more-passenger-commute-priestmangoode. [Accessed: 20-Aug-2018]. K. Chan, "Vancouver leading Canada in transit ridership growth: StatsCan", Daily Hive, 2017. [Online]. Available: http://dailyhive.com/calgary/canada-public-transit-rideship-growth-statistics-caanda-1996-2016. [Accessed: 30- Aug- 2018].